Congratulations! The journey has started. The Citadel is definitely different from other non-military colleges. There are a few tips for new parents to help your cadet recruit, or knob, and you this next year. 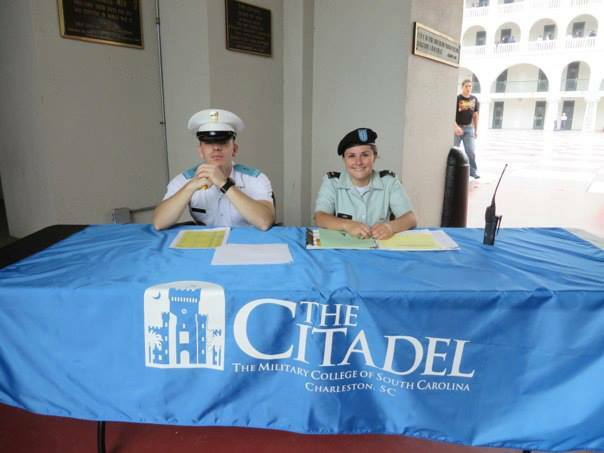 Two Citadel Family Association volunteers at 1st Battalion. The Citadel is a Leadership school. That means now that your knob has reported it is up to them to navigate the system. parents should not call the school and make requests like special leave, talk to their professors like you did with high school teachers. Being a “Helicopter Parent” will not help your knob. Knobs line up in 3rd battalion to get their pT clothes. The school does a great job of posting updates to various social media sites, like Facebook and Twitter, and YouTube. They will also post photos you can browse through and purchase. The goal of every knob is to be invisible, or a “Ghost knob.” If you see your knob in a photo of the site, share it on your own Facebook page but Do Not post any comments to the page. Set all your privacy settings to Friends only. That includes your photos too. If you have friends who are the parents of upperclass cadets don’t post questions specific to their walls. Send a private message instead. Email the Citadel Family Association Company and/or the Battalion rep for you knobs company or battalion. They can be a great resource for traditions specific to your knobs company. Do Not have your knob as your profile pic or cover photo. You will not hear from your knob until next week. When you talk to them do remind them this is a military COLLEGE. If they don’t pass their classes they won’t stay in school, no matter how shiny their shoes and brass looks. Knobs tend to try to do everything and skip sleep. That is not a sustainable plan. School work must be a priority. Sleep is necessary. Fit the polishing in where they can. Budget 20 – 30 minutes a night. Your role as parents should be to encourage them to get these priorities straight right away. The knob has to be the one to implement the plan. The sooner a knob learns to pull together with their classmates the better. Do not listen to rumors. Go to a primary source for clarification. If it didn’t happen to your cadet or to you don’t repeat a story you’ve heard. I covered some of this advice in a previous post about the Rumor Mill after rumors began to fly last fall. Learn the school website. I’ve added the most frequently accessed pages to an entry called Helpful Web Links. Bookmark the entry for future use. Do send encouraging letters and small boxes of goodies. The Cadet Activities website is a great resource and they will post photos too. Use your time this week learning how to read the training schedules. If you’d like to see the training modules they will be shown check out the Training page on the Office of the Commandant page under Operations and Training. Join the Facebook groups for parents, but do not post to the ones with cadets in them. The group for 2017 parents only has new parents and a few parents of graduates who volunteer their time to answer questions. To join the group email me and let me know your knobs name and company. My email address is in the About section of the group page. See the entry on Facebook groups or direct links to other groups. To tide you over as you wait to see more photos from the school See these albums of photos I took this weekend. Make plans to attend Parents Weekend. Hotels book quickly. See this entry for information of Parents Weekend. A few other photos from Sunday Morning. Next PostNext SkinnyScoop Nomination for Top 25 Military Mom Blogs!